DANIEL W. NEBERT, BA(chemistry), MS(biophysics), MD, completed pediatrics training at UCLA Medical Center and then a postdoctoral fellowship in the National Cancer Institute (Bethesda, MD). He is board-qualified in both pediatrics and human genetics. Since 1968, he has headed a laboratory that carried out basic science and clinical research in genetics at the National Institute of Child Health & Human Development (NICHD), and, since end of 1989, as professor at University Cincinnati Medical Center and Cincinnati Children’s Hospital (Ohio). He has received many local, national, and international awards. Since 2013 he has been professor emeritus. Nebert’s discovery of the aryl hydrocarbon receptor (AHR) with Alan Poland in 1974 is among his biggest research breakthroughs. His discovery of the solute carrier family-39 member-8 gene (SLC39A8) encoding the zinc/manganese bicarbonate-dependent transporter (ZIP8) with Tim Dalton in 2005 is another of his biggest research breakthroughs. 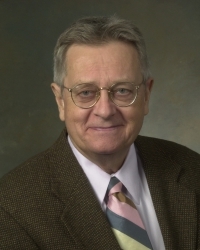 Starting in 1985, Nebert also spearheaded the cytochrome P450 gene (CYP) standardized nomenclature system, based on evolutionary divergence [http://drnelson.uthsc.edu/cytochromeP450.html], a system that has now expanded to include virtually all genes in all genomes of organisms on the planet [http://www.genenames.org/]. His primary research theme has always been: “Given the same dose of a drug (e.g. phenytoin, valproic acid), or the same exposure to an environmental toxicant (e.g. cigarette smoke, cadmium), why do any two individuals respond differently?” He is author/coauthor of more than 640 publications in the scientific literature and has written many dozens of invited “Opinion” articles for The Cincinnati Enquirer and The Oregonian newspapers. Nebert was Principal Investigator of the T32 “Gene-Environment Interactions” Training Grant (GEITP), funded by National Institute of Environmental Health (NIEHS) from July 2008 until 2014. These email messages (“lessons”) first served as a teaching tool to the GEITP Trainees and Mentors, but then expanded university-wide. And presently there are ~100 colleagues in the Greater Cincinnati Area, and another ~200 colleagues ‘blind-copied’ worldwide on six continents, with more colleagues enthusastically joining the “GEITP Emailing List” each month. The theme of this GeneWhisperer.com web site is therefore “Gene-Environment (GxE) Interactions”.